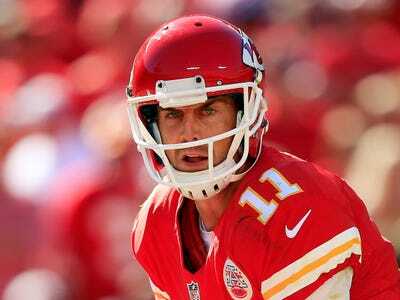 Jamie Squire/Getty ImagesCortana likes Alex Smith’s Chiefs over the Seahawks. Microsoft’s Cortana had a good Week 10, correctly predicting nine out of 13 NFL games for the second-straight week. It’s now 97-50 (66%) on the year. Cortana is a Windows phone virtual assistant that uses a Bing Predicts algorithm to predict every NFL game this season. The algorithm factors in things like advanced stats, homefield advantage, and weather, in addition to a public sentiment component based on Facebook and Twitter data. It picks games straight up, not against the spread. After correctly predicting 15 of the final 16 games of the World Cup, Cortana has been relatively average picking NFL games. Las Vegas betting favourites are 97-48-2 on the year, and Nate Silver’s ELO model is 103-44. In Week 10, Cortana and ELO went 9-4 while Vegas favourites went 10-3. The only game Vegas and Cortana disagreed on was Buccaneers-Falcons. Cortana and Vegas agree on every game right now, although there’s plenty of time for things to change before Sunday.